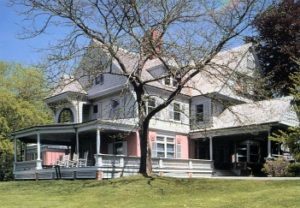 On Long Island’s North Shore we will visit Sagamore Hill, the mansion Theodore Roosevelt built in 1884-85 and used during the summers of his presidency, 1901-08. Family furnishings remain in the house. Time permitting, a drive through part of what was Louis Comfort Tiffany’s estate will afford glimpses of remain-ing elements. After lunch we go to Raynham Hall. The oldest part of this house, built in 1738, has ties to Revolutionary War spies. A Victorian wing was added in 1852. Our last stop will be at Coe Hall and Planting Fields Arboretum. The 65-room Tudor Revival style mansion was built in the early 20th century for William R. Coe, an insurance executive, and his wife, Mai, heiress of a Standard Oil fortune. Hundreds of acres of gardens surround the mansion. Please note to also select your lunch menu option when paying for this event.